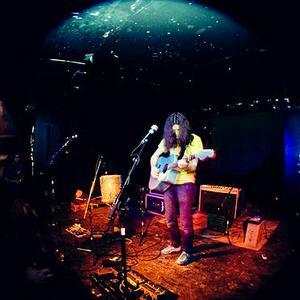 Kurt Vile is a guitarist and singer from Philadelphia. He was previously the lead guitarist in the band The War on Drugs and also has a burgeoning solo career. He was signed by Matador Records in May 2008 as a solo artist. His music has been likened to Bruce Springsteen, Bob Seger, and Tom Petty. His first album for Matador, titled Childish Prodigy was released in October 2009. Prior to signing with Matador, Vile released two albums, God is Saying This to You and Constant Hitmaker, on Mexican Summer and Woodsist, respectively. His music has been likened to Bruce Springsteen, Bob Seger, and Tom Petty. His first album for Matador, titled Childish Prodigy was released in October 2009. Prior to signing with Matador, Vile released two albums, God is Saying This to You and Constant Hitmaker, on Mexican Summer and Woodsist, respectively. He plays both solo shows as well as shows with a backing band called The Violators. Smoke Ring For My Halo, released in March of 2011, is Kurt Vile's fourth album and second official release for Matador Records. Uncut placed the album at number 14 on its list of "Top 50 albums of 2011" and garnered Vile the iTunes #Rewind2011 Singer/Songwriter Album of the Year. Vile followed up the widely acclaimed album with the six-song EP release, So Outta Reach, in November of the same year. The EP was composed of tracks originating from the same sessions that birthed Smoke Ring for My Halo. So Outta Reach includes the single 'The Creature', acknowledged as one of Vile's best, and a driving rock cover of Bruce Springsteen's 'Downbound Train'.